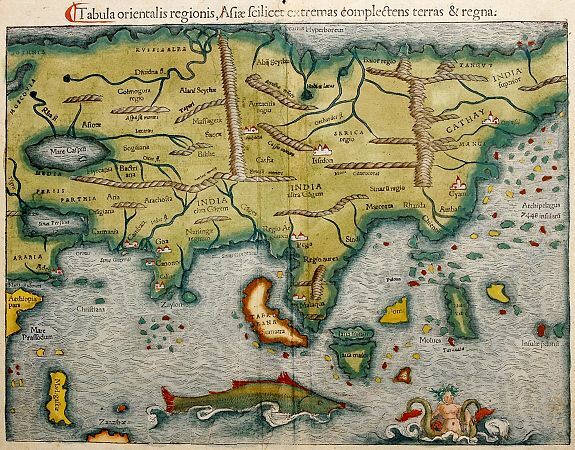 MÜNSTER -Tabula orientalis regionis Asiae. . .
MÜNSTER, S. - Tabula orientalis regionis Asiae. . .
Tabula orientalis regionis Asiae. . . - MÜNSTER, S.
Title : Tabula orientalis regionis Asiae. . .. Date : Basel, c. 1580. Size : 10.2 x 13.6 inches. / 25.8 x 34.5 cm. Description :Central and East Asia. Woodcut map from a Latin edition of Sebastian Münster's Cosmographia, Basel c. 1580. Verso typogr. text: "Nova Tabula Indiae orientalis.." and page sign. "12". Condition : Good clear impression with wide white margin. Attractively coloured. Two soft folds along center-fold.